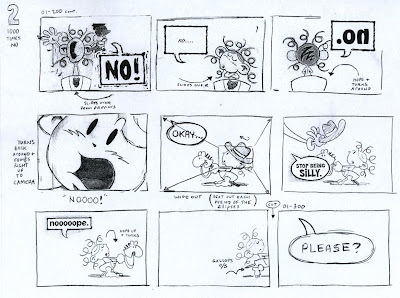 Whenever I wade into the jungle of my old files, swinging my machete right and left to clear through the miasma of paper and cel, I invariably come across some fun, often postable stuff. Case in point the image above. That there's my very first business card circa 1990, which I neglected to mention in my former post about business cards-- mainly because i didn't think I had any kicking around. Every once and while, an old pal will pull one out of their wallet to show me they've got one, but I thought all mine were gone. Apparently not so! It was actually my first attempt at an animation cel. I got some sheets of acetate, ran 'em through a xerox machine and then used some sort of acrylic paint to color it. Not the prettiest thing, but it did the job. And that's still my parents phone number- hence the strategic blocking out. Don't want you weirdos calling my parents and asking personal questions about me. 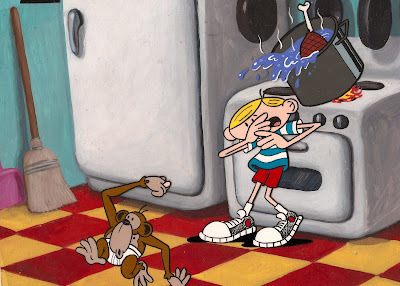 And speaking of cels, the picture below was a cel set-up I included in my original pitch for Kenny and the Chimp. And yup, you guessed it. 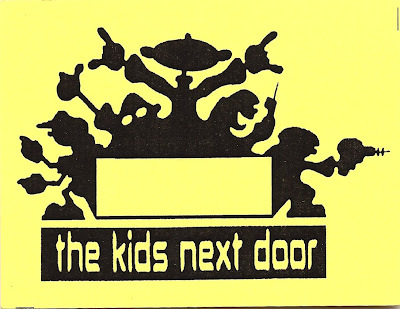 That there's an original Gideon Kendall hand-painted background, done back before we were rockin' Pepper Ann and Kids Next Door together. 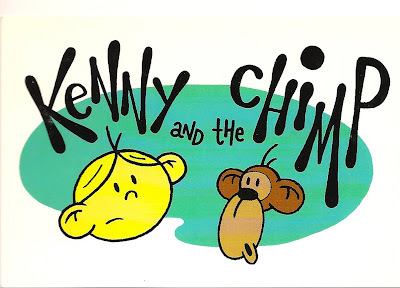 The original pilot episode I wanted to do was called 'Got Your Nose' and concerned Chimpy constantly stealing Kenny's nose off his face. That's what's he's got in his hand, high-tailing it out of the kitchen like a monkey that just stole yer nose. 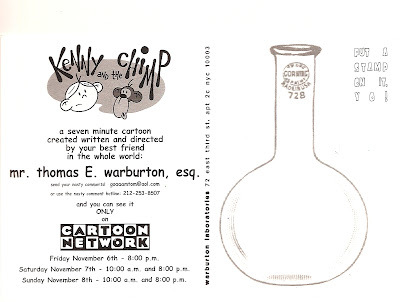 Also, please note Kenny's watermelon-shaped head... which later got changed to more of a basketball-shape because Cartoon Network thought he looked too much like Hey Arnold. So throw your hands in the air and shout if you like old school! SIGNED IF YOU WANT SIGNED! So a lot of friends, family, friends of family, family of friends, friend's families Pilate's instructor's best friend's families and even a couple arch enemies who don't live close to NYC have asked me how to get their copy of 1000 Times No signed. 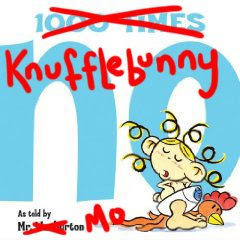 Unfortunately, they want me to cross out the title, write Knufflebunny, and have Mo Willems sign it. But you'll have to hit me back for shipping. Even though I'm a big shot animator/author/dance instructor/ninja that makes THOUSANDS of dollars EVERY YEAR I can't afford to pay everyone's shipping. So go on... they make great gifts, collector's items, ballast for your car trunk, etc etc. 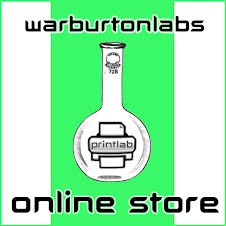 All ya gotta do is drop me a line at warburtonlabs@nyc.rr.com and we'll set something up. But, you know, serious inquiries only. Please don't e-mail me asking for 5 bucks or with questions regarding state capitals or US presidents. It's NOT always about me, you know. 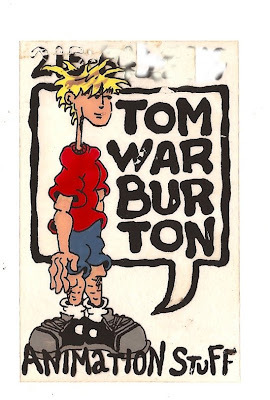 I know all this talk about me, Mr. Warburton, can get tiresome at times. 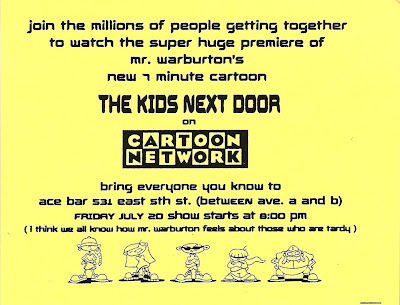 So just to prove to you that's it's not always Mr. Warburton, all the time, I wanted to tell you about a sure-fire fun event going on this weekend. Crap... now it's about ME again. 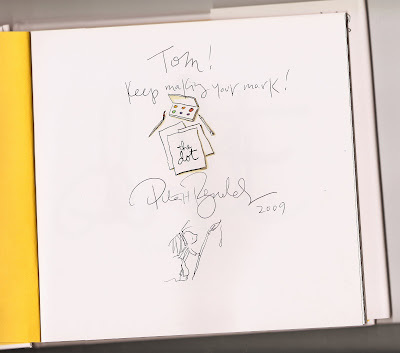 Regardless, I've mentioned it before... but I'm not the only hard workin' guy out of Curious Pictures to release a fabulous book in the last couple months. Sooper powered director Ro Rao has, too! 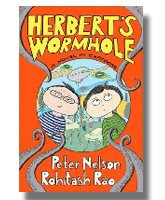 It's called Herbert's Wormhole and it's REALLY fun. Tons of great drawings, a rockin' website, and crazy fun videos. 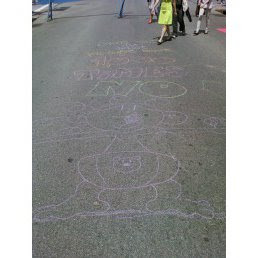 What's more, he and his writing partner Peter Nelson put on a knockout show for the kids. 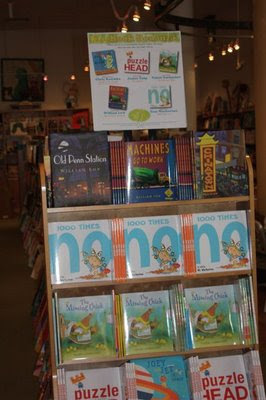 And the next stop on their whirlwind tour is Books of Wonder here in NYC. So come on out this Sunday and set your laugh-o-meters for FUN! All the info you need is right over HERE! 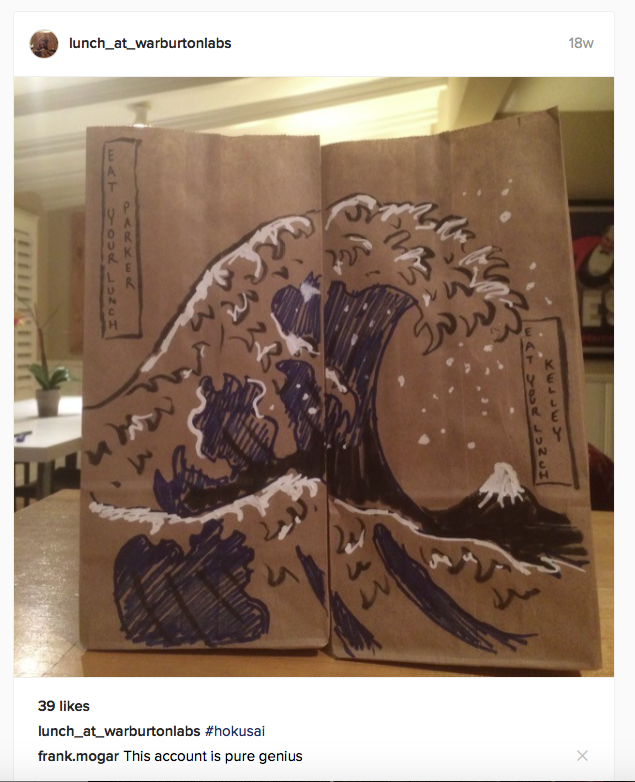 She better have gotten an A+! Here's a cool little sumthin' that someone sent me on Facebook. 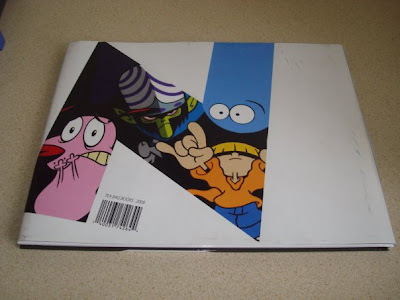 KND operative Alejandra (aka Male...'but not pronounced like the English Male') from Sector ES in El Salvador is a graphic design major and put together a book about Cartoon Network for a project. And it rocks pretty hard. I'm thinkin' A sooper triple plus. 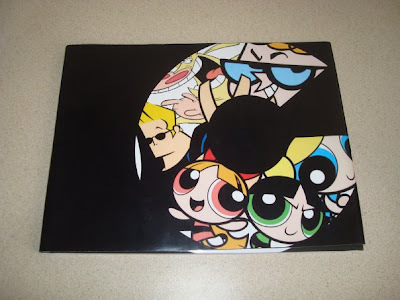 And, you know... for some completely insane reason Cartoon Network has never made a book about the network. 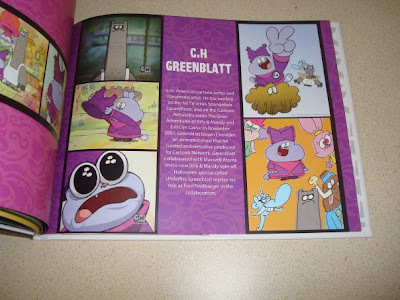 So hows about someone from CN give Alejandra a call and make this happen? Not to mention I've got some kinda earth-shattering stuff going on in my life, which I'll tell you about later. But I couldn't say NO to an event going on here in Brooklyn that STINKS so much! 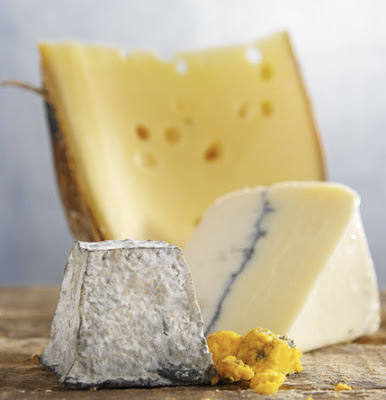 It's called Stink-Fest and it's an all day fun-fest put on by sooper tasty cheese shop STINKY, bklyn. BEST CHEESE SHOP NAME EVER. So outside of the store on Saturday June 28th there's gonna be music... a cheese eating contest... and ME reading 1000 Times No! I think they really wanted sooper pal Jon Scieszka to read his classic The Stinky Cheese Man but when they couldn't get him they decided to get someone who's books REALLY stinks. Should be a fun stinky day so come on out! All the info is over HERE! In other NO news, there's a nice little review of 1000 Times No that feeds off the nice little review we got at 7 Impossible things Before Breakfast. That's right over HERE. And even though it's kinda short, there's a nice little mention of the book over HERE. 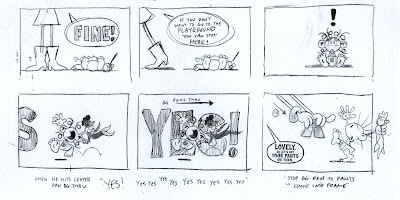 Aaaaaaaaaand should I mention that we just got greenlit to do a full animated version of 1000 Times No as a pilot for a series of interstitials on a certain kids network? I love gettin' em and I love sendin' em. 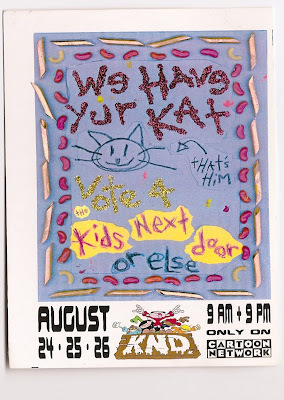 They're also good records of all my old home and e-mail addresses! 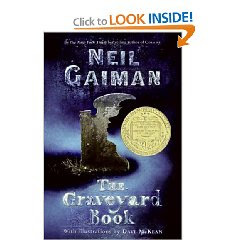 But now the folks at Amazon.com have been cool enough to put the video up on the book's sales page! 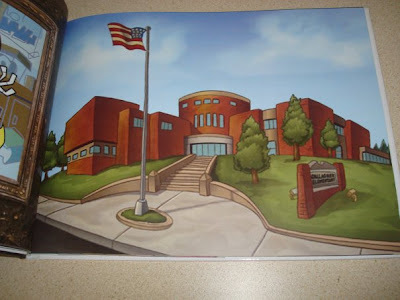 It started out on Friday with a visit to the Washington School in Nutley, New Jersey. Boy, do those kids know how to yell the word NO! Man, I need to practice more before I go to visit these schools. On Saturday, it was back to Brooklyn where I stopped by Mini Jake the sooper hip children's store in Williamsburg. There was a street fair going on outside the store so I got myself a comfy chair, a table full of books and hawked my wares! And you know what the best way to get people to stop and look at your book is? 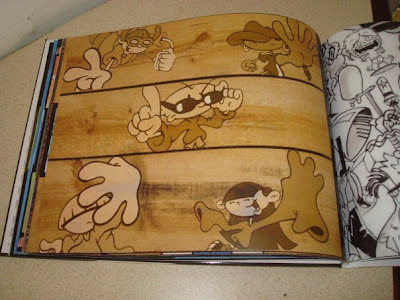 This book was cute. I love how the author comes up with all of the original ways of saying no. Languages all over the world, written on a plate with peas, text messages... You name it, it is there. Perfect for parents who might want to get their kids thinking that saying no isn't always in what they want to say. (going to the park is fun!). This is a great book for storytime, but especially bedtime. Why not go and put up your own fabulous review? 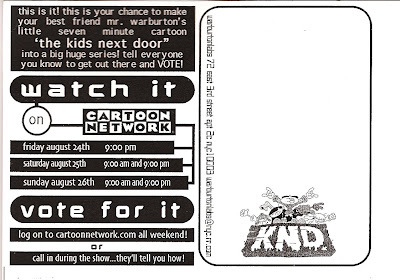 Again,I'm a tad late on the latest KND story in DC's Cartoon Network Action Pack... but better late than never! 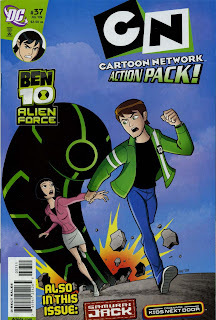 This issue features a knock down, drag out, kick in the shins battle between the KND and the DCFDTL you really don't wanna miss! 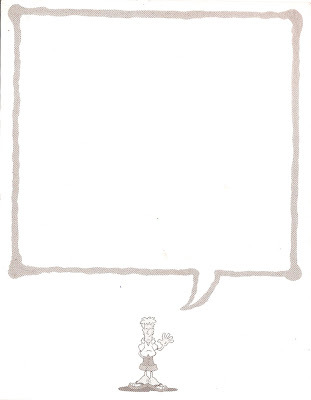 And you HAVE been looking REAL hard at the last couple issues, haven't you? Because, you know, there might be something there. 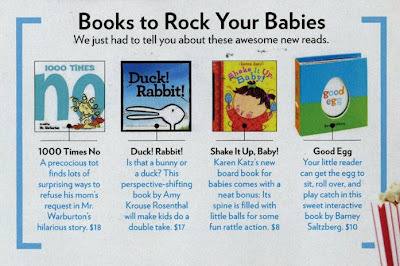 But once you've finished reading those... be sure to check out page 22 where none other than a certain someone's book is claimed to give the rockingness to babies. WOW! 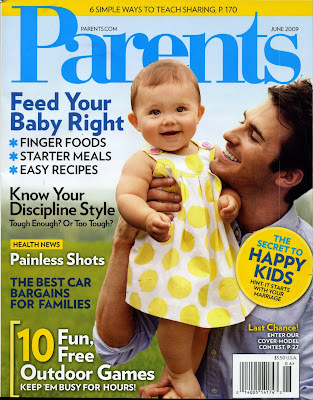 Big thanks for the plug, Parents Magazine! 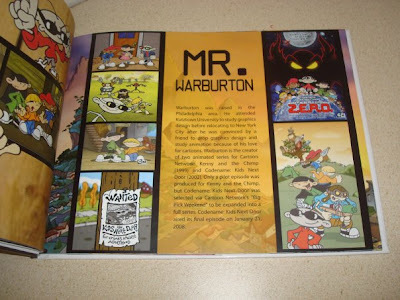 "Warburton is obviously all about cartoon, even the animated kind. 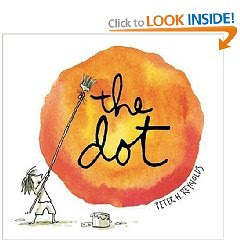 In 1000 Times No, he treats us to lots of color, thick black lines, simple text, and a lot of comforting round-ness." 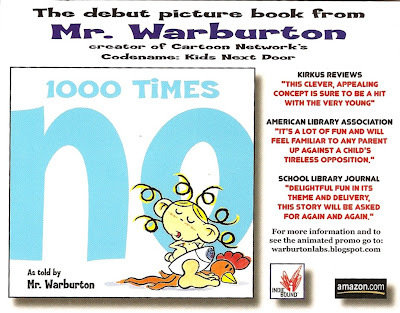 "...it’s a hoot of a lap-read with your favorite wee child. It’s light. It’s funny. Even enlightening. (Hey, I didn’t know how the Dutch negated something—or how to pronounce it—until now.) Good times." 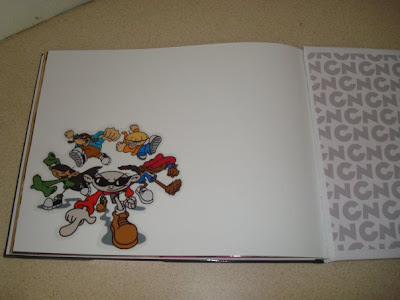 "The illustrations are engaging, starting simple and growing in complexity with each page turn. 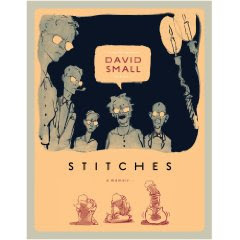 The cartoon style is enhanced by the watercolor treatment of the bold black outlines and the exaggerated shapes of the characters. There are plenty of fun things to catch along the way, like the cartoon on the diaper that matches the expression of the toddler." "...it was the book trailer that made me certain that this was a book I'd need to see. In fact, now that I've read the book, I appreciate the video even more for giving the pronunciation of all the different no's featured. (And props to the kid who nailed them all. 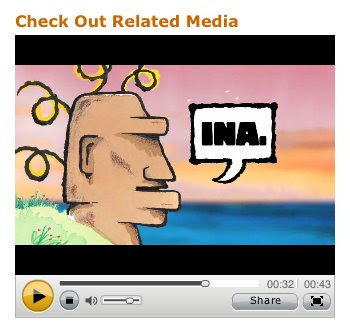 Or so I guess, not speaking Rapanui myself.)" The rest of the review is right over THIS WAY! Now, THAT'S a nice batch of reviews, huh? 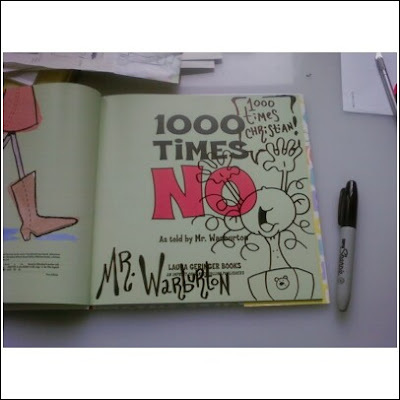 That's the 'Free Books For Mr. Warburton Sooper Fun Time Expo'. Because I made out like a BANDIT! They're just GIVING the reading material away! 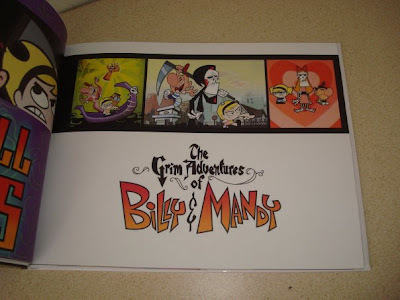 Ya want a book autographed? Get in line and they'll GIVE you one! Want an ARC (advanced reading copy) of 'Catching Fire' before it hits stores? Grab one (while supplies last)! So I wandered the expansive floor of FBFMWSFTE, first with my sooper triple awesome editor from DC comics, Elizabeth Gehrlein (who lords mightily over our KND stories in Cartoon Network Action Pack) and then with Mr. Willems (which is kinda like wandering around Guitar Center with Jimmy Page). 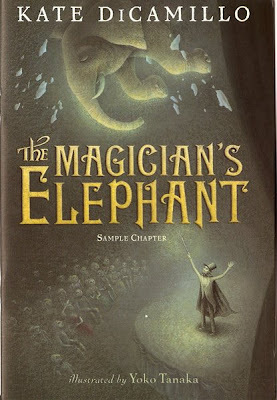 First off is a sample chapter of the fabulous Kate DiCamillo's 'The Magician's Elpehant'. And just so you know, you don't have to hate Kate just because she's an unbelievable writer. You can hate her for her hair, too. Or her laugh. Or any number of things. But it's her writing that makes you hate her the most because she makes you feel so TALENTLESS! 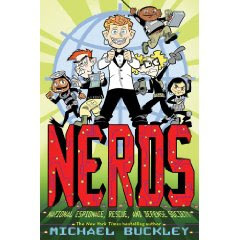 And I got this little excerpt of NERDS by Mr. Michael Buckley, who I met a couple weeks ago at a benefit and really liked alot. 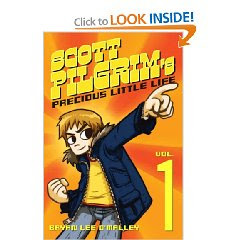 And isn't it kind of embarrassing that I STILL haven't read any Scott Pilgrim? While most people are popping up... Mo's popping OUT. And that's just the REALLY awesome stuff I got. But just so you don't think that FBFMWSFTE is only about free books... it's ALSO about networking and such. So here's a pic of Mo, me, and sooper kid-lit blogger Mother Reader who CLAIMS she actually likes 1000 Times No and is gonna review it this week. Let's hope for another good one! So yeah... BEA rocks pretty hard and I'll be going back again. Did I mention there were free books? So a couple months ago I saw that Mr. Trussell was on that thar Faceamambook thingie and we struck up a conversation-- which turned into a bit of a fracas. See, he won't accept that he's awesomer than I am. I keep telling him he is but he keeps denying it. But deep down he KNOWS he is. And he LIKES it, too! Case in point... I sent his son a KND drawing. So what does the guy do? He has to ONE UP ME! 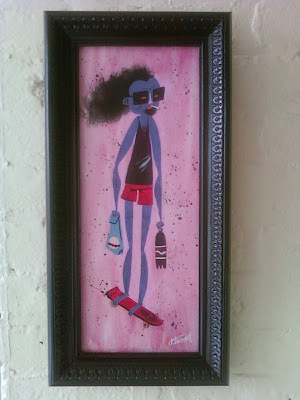 He just HAS to send me an AMAZING ORIGINAL PAINTING FROM HIS RECENT GALLERY SHOW! ALL JUST TO REMIND ME THAT HE'S MORE AWESOME! How am I supposed to top that? Oh, and perhaps you'd like a little icing on that 'in your face' cake Mr. Trussell is serving? Guess I'll just have to hang it on my wall and bask in its awesomeness while I dig around Joel's awesome website.